We are a full service wellness clinic, offering Chiropractic services, massage therapy, physical therapy, acupuncture and nutritional supplements. We accept any PPO insurance, and Medicare. Please see our website at for more information! 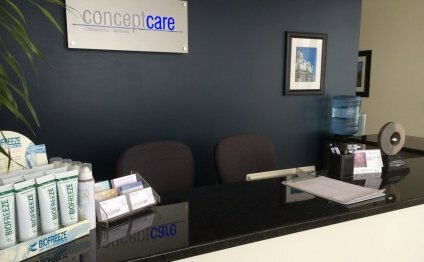 Concept Care has been located in Downers Grove since 1990. Dr. Kirk received his Bachelor of Science from the University of Waterloo in Canada. He then attended the National University of Health Sciences, graduating in 2003 with both a Bachelor of Science in Human Biology and a Doctorate of Chiropractic. He has completed training in Applied Kinesiology and is certified to practice Acupuncture. Ergonomics has always been an emphasis for Dr. Kirk. He has trained nurses on modified lifting techniques to help prevent back injuries, as well as rearranging workstations to prevent carpal tunnel syndrome, headaches, and other conditions.